One more problem had to be solved; it had to be a mountain which would not collapse. They knew that they had to embark on a venture into the unknown but they set out on it full of confidence in a magnificent invention. It was Imhotep’s stabilising buttress wall. As the future was to show, this invention carried the Egyptian architects through a period of unparalleled achievement. The next problem was the labour force. Imhotep must have felt pretty confident in the ability of his administration to provide him with a labour force twenty or thirty times larger than that used for the stone mastaba. It was most likely at this juncture that mainly seasonal labour began to be employed, leading to the beginning of a new economic pattern. When the pyramid of four steps had been completed, Imhotep and his colleagues knew that their stability calculations had been correct. They also knew by this time that the new employment pattern was not only feasible but that it was eminently successful. Unless they had been satisfied on this last issue, they would hardly have embarked on the next two enlargements of the pyramid, the first by widening it, and the second by heightening it to six steps. The quantity of stone required in these successive operations amounted to no less than 650,000 tons, more than three times that already invested in the four-stepped pyramid. This fantastic escalation of effort, all in one and the same project, leaves little doubt that seasonal mass employment was proving its worth, not only at the building site but also probably in the government of the emerging state structure. 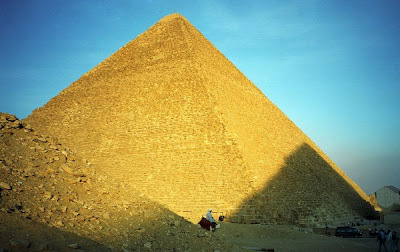 With this final enlargement, pyramid building had passed from the stage of a daring experiment to the basic work-pattem of the Egyptian society. It is a pity that the technological evidence of the rest of the Third Dynasty does not allow us to follow the decisions of builders and administrators with the same clarity as in the construction of Zoser’s pyramid. The two unfinished pyramids of Sekhemket and Khaba show that pyramid building continued during their short reigns. We do not, of course, know whether Zoser’s pyramid was finished in his own lifetime. If not, it may have been decided that the available labour force had primarily to be employed in its completion, leaving a rather smaller number of workmen for the two new monuments. However, the reason why they were never finished has probably nothing to do with the labour supply. Something had happened to the direction of the administration in using the royal power.